You could call it the most important day for the Chiefs in 2019. Well, so far. KANSAS CITY, Mo. — You could call it the most important day for the Chiefs in 2019. Well, so far. But, while fans were excited for the match up. They were also trying to stay warm. "Just have, we got the propane heater going with the fireplace. We have the hand warmers, body warmers, feet warmers. I think we are all set," said Zach Weiglet, who traveled from Mississippi to watch the game. 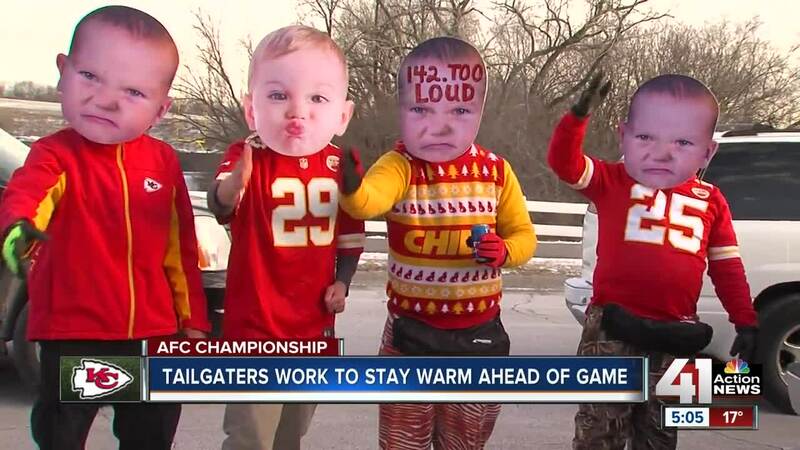 Even national sports commentators said the famously loud Arrowhead Stadium won't be as loud because of the cold. "Everybody will be wearing a ski mask. People aren't going to be standing and cheering," said commentator, Colin Cowherd. "If you think that we are going to be quite, this is our first AFC Championship game. We're going to be loud and proud, baby," said Paul Lang, who was tailgaiting early with his family. Tailgaters said layering is the best way to survive. "I'm only wearing 5 layers right now but have a couple more if needed," said Weiglet. While one fan kept his tradition of wearing his shorts to the game. "I wore this outfit the first game six years ago and we won," said Dustin Talleur. "So, I keep wearing it." Even if it gets into the single digits. "I'll continue to wear the outfit. No questions," said Talleur. While the forecast calls for below freezing temperatures, the atmosphere will be filled with red hot energy.